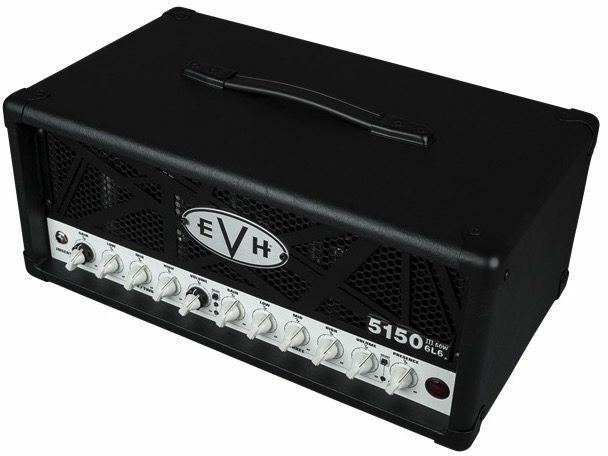 With its smaller size and portability, the EVH Van Halen 5150 III 50 Watt 6L6 Tube Guitar Amplifier Head is the perfect amp for players who want arena volume and performance in a compact package. Three channels of road- tested sound work for any playing style -- crisp cleans, raw crunch or searing leads, while newly added independent dual-concentric controls allows for gain and volume level matching. This 2.0 version of our popular 50-watt head delivers a full-spectrum of tone -- channel one powers crystal-clear clean tone, channel two ranges from chunky overdrive to tight distortion, and channel three oozes with liquid gain. Channels one and two each have dual concentric gain/volume controls, with shared EQ (low, mid, high). Channel three has its own gain, volume and EQ (low, mid, high) controls. All three channels also have global presence and global resonance controls. This amp head also includes selectable impedance (4, 8 or 16 ohms), dual parallel speaker output jacks, effects loop, headphone jack, line out and a four-button footswitch with 1/4" input jack and MIDI input. "Just buy it and be done!" Overall: I blew up my peavey because I'm an idiot. So my wife graciously allowed me to purchase this amp. I have played through all of the standard high gain amps as well as the botique ones, but this thing puts em all to shame for the money! I play a lot of styles of music. Bluesy stuff, some shredding, funky cleans, rock, metal, ect. This amp can do it all. There is no limit on my creative capacity with this thing. The clean channel is what I feel like a fender amp should be (take it with a grain of salt, i have never played through a fender tube amp), channel 2 is great for all varieties of distortion and can get into metal territory, channel 3 has your blistering leads and crushing tones all packed in tight. This is three amps in one with no compromises. Do something nice for yourself. You won't be dissappointed. Style of Music: See review! Lmao. Overall: If you are looking for an amp that can be used for any kind of metal tone, look no further! I couldn’t be more impressed! Never thought i’d say that an amp has more gain than I could ever need, but it does! .....and I mean this in the most positive way! I play mostly metal, using the blue channel with a Tubescreamer is absolutely perfect!